Additional Info: Public expenditure on education consists of current and capital public expenditure on education includes government spending on educational institutions (both public and private), education administration as well as subsidies for private entities (students/households and other privates entities). There are several questions that i would like answers for. Before i seek those answers though, its clear that Ja’s spending is heading downward. 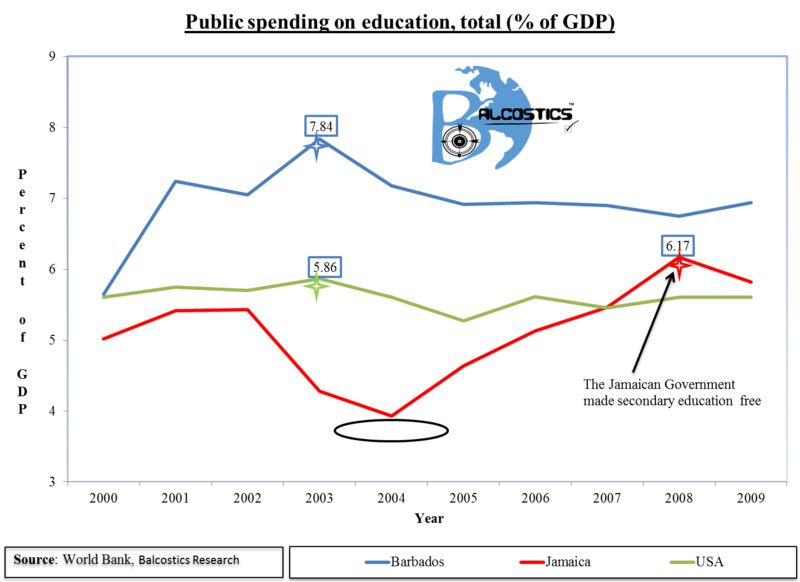 Even though Barbados’ spending experienced a decline albeit that it was a protracted one – Ja’s on the other hand was increasing its spending (at a protracted rate) on education at the same time(it was noticeably at a lower position from where both Barbados & the USstarted). While Barbados’ spending is on the increase, its not significant and the US’s spending seem stagnant as well. Now to my questions: what are the results from the spending increases in Ja,, and is it any different from those now? Is there a difference in the perception among Jamaicans of education when spending is high or low?